Monosodium Glutamate: Is MSG bad for your health? Glutamate flavoring is the term used for flavor-enhancing compounds like glutamic acid and its various salts or glutamates. The taste they impart is called “umami,” or having a savory characteristic typical to that of broths and meat-based dishes. Glutamates are used in many food products including fermented foods, soy sauce, cheese, and even yeast extract. However the most popular and controversial glutamate is synthetic monosodium glutamate (MSG). Glutamic acid is an amino acid that is produced by our bodies and is the most common excitatory neurotransmitter in the central nervous system. It should be noted that the human body naturally produces glutamic acid and there is no chemical difference between the glutamate found in MSG and the one in natural foods. However, in order to establish whether or not MSG is bad for your health, more information is necessary. Why is Monosodium Glutamate (MSG) used? MSG is mainly used as a flavor enhancer, specifically when it comes to the food’s savory or meaty profiles. It was once thought to be only prevalent in Asian cooking, but it can now be found in a lot of processed foods in Western countries. What arguments could be made for the use of MSG in food? The concerns regarding Monosodium Glutamate range from being associated with obesity to being a contributing factor to headaches and depression. Again, Glutamic acid is an amino acid that is produced by our bodies and is the most common excitatory neurotransmitter in the central nervous system. 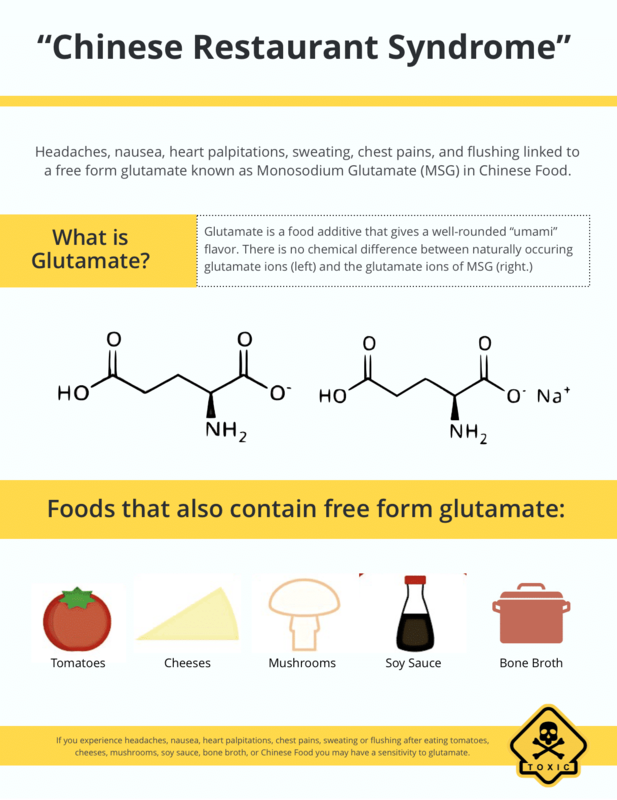 Freeform glutamic acid, in the form of MSG, can cause an over-stimulation of the central nervous system and may account for the sensitivities to glutamate that are experienced by some individuals. While free-form glutamate from MSG may cause this issue, other foods that are naturally high in glutamate may also cause similar symptoms. Common foods include matured, cured, and preserved meats, cheeses, mushrooms, ripe tomatoes, soy sauce, and bone broth. If you experience muscle tightness, flushing, and headaches or general malaise following the consumption of these aforementioned foods, MSG may be bad for your health. The USDA has given Monosodium Glutamate a generally recognized as safe (GRAS) designation, and the European Union classifies it as a permitted food additive as well. Popular alternatives include soy sauce, turmeric, cumin, and various salts such as sea salt and Kosher salt. However, these alternatives don’t have the same umami effect of MSG, but they can enhance or improve the overall flavor to some degree. Is MSG allowed in Certified Paleo Programs? 1. Monosodium Glutamate is a synthetic substance. 2. It is widely believed that Monosodium Glutamate is neurotoxic although it is not well substantiated. 3. The majority of the Paleo Community does not support the inclusion of MSG in food products. 1. Rundlett KL, Armstrong DW. Evaluation of free D-glutamate in processed foods. Chirality. 1994;6(4):277-82. 2. Mallick HN. Understanding the safety of glutamate in food and brain. Indian J Physiol Pharmacol. 2007;51(3):216-34. 3. Rhodes J, Titherley AC, Norman JA, Wood R, Lord DW. A survey of the monosodium glutamate content of foods and an estimation of the dietary intake of monosodium glutamate. Food Addit Contam. 1991;8(5):663-72. 4. Beyreuther K, Biesalski HK, Fernstrom JD, et al. Consensus meeting: monosodium glutamate – an update. Eur J Clin Nutr. 2007;61(3):304-13. 5. Collison KS, Maqbool Z, Saleh SM, et al. Effect of dietary monosodium glutamate on trans fat-induced nonalcoholic fatty liver disease. Journal of Lipid Research. 2009;50(8):1521-1537. doi:10.1194/jlr.M800418-JLR200. 6. Maluly HDB, Arisseto-Bragotto AP, Reyes FGR. Monosodium glutamate as a tool to reduce sodium in foodstuffs: Technological and safety aspects. Food Science & Nutrition. 2017;5(6):1039-1048. doi:10.1002/fsn3.499. 7. Jinap S, Hajeb P, Karim R, Norliana S, Yibadatihan S, Abdul-Kadir R. Reduction of sodium content in spicy soups using monosodium glutamate. Food & Nutrition Research. 2016;60:10.3402/fnr.v60.30463. doi:10.3402/fnr.v60.30463. 8. He K, Du S, Xun P, et al. Consumption of monosodium glutamate in relation to incidence of overweight in Chinese adults: China Health and Nutrition Survey (CHNS). The American Journal of Clinical Nutrition. 2011;93(6):1328-1336. doi:10.3945/ajcn.110.008870. 9. He K, Zhao L, Daviglus ML, et al. Association of monosodium glutamate intake with overweight in Chinese adults: the INTERMAP Study. Obesity (Silver Spring, Md). 2008;16(8):1875-1880. doi:10.1038/oby.2008.274. 10. Thu hien VT, Thi lam N, Cong khan N, Wakita A, Yamamoto S. Monosodium glutamate is not associated with overweight in Vietnamese adults. Public Health Nutr. 2013;16(5):922-7. 11. Quines CB, Rosa SG, Da rocha JT, et al. Monosodium glutamate, a food additive, induces depressive-like and anxiogenic-like behaviors in young rats. Life Sci. 2014;107(1-2):27-31. 12. Obayashi Y, Nagamura Y. Does monosodium glutamate really cause headache? : A systematic review of human studies. The Journal of Headache and Pain. 2016;17:54. doi:10.1186/s10194-016-0639-4. 13. Anon, (2018). Chinese restaurant syndrome: MedlinePlus Medical Encyclopedia. [online] Medlineplus.gov. Available at: https://medlineplus.gov/ency/article/001126.htm [Accessed 15 Jun. 2018]. 14. Anon, (2018). [online] Available at: https://www.fda.gov/food/ingredientspackaginglabeling/foodadditivesingredien ts/ucm328728.htm [Accessed 15 Jun. 2018].